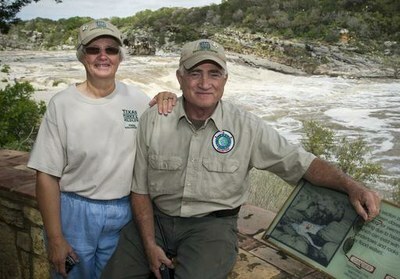 Park hosts are volunteers who supplement park staff and serve as representatives of the Texas Parks and Wildlife Department. Hosts assist park visitors and support the operational needs of the park. State parks provide a beautiful setting for a rewarding and memorable park host experience! There are host opportunities at parks throughout the state and each park has its own unique features and special qualities. Each park manages its own park host calendar and most rely on volun­teers throughout the year. Hosts serve a minimum of one month and a maximum of six months; this may be extended with the approval of the park superintendent. What are the duties of a host? All hosts provide excellent customer service to visitors and give information on park facilities, resources, park rules and attractions. Given the diversity of Texas landscapes and the varying size, structure and needs of state parks, additional host tasks vary from park to park. Duties may include litter collection, light maintenance, office duties, interpretation or fee collection. Hosts do not perform law enforcement duties. To fully understand host duties, expectations, amenities and policies of the park, hosts must carefully review the volunteer opportunity posting and talk directly with the host coordinator at the park prior to accepting an assignment. To learn more about park host policies and procedures, check out the Statewide Texas State Parks Host Manual. In exchange for volunteer service hours, parks provide hosts an RV site during the tenure of their host placement. Host sites have water and electrical hookups and many also have sewer hookups. Hosts are required to maintain these campsites in an orderly manner. Further, hosts receive training from park staff and get to be part of a passionate team working to manage and conserve Texas’ natural and cultural resources. For applications and opportunities go to our "Volunteer for Texas Parks and Wildlife" web page. More information on volunteer opportunities and other ways to help Texas State Parks.